The key to enjoying our long Michigan winters – longer still for those of us up north – is to find something you enjoy doing during the snowy months. Fortunately, there’s no shortage of fun winter activities for the whole family. Skiing, ice fishing, sledding, snowshoeing and more keep locals and visitors busy from December through March. Not ready to learn about or invest in any of those activities? Take a hike! It’s free, it’s healthy, and it’s a great way to shake the cabin fever. The following natural areas protected by the Grand Traverse Regional Land Conservancy excellent places to hike (or snowshoe!) during winter. For directions and more info about these places, visit www.gtlrc.org. 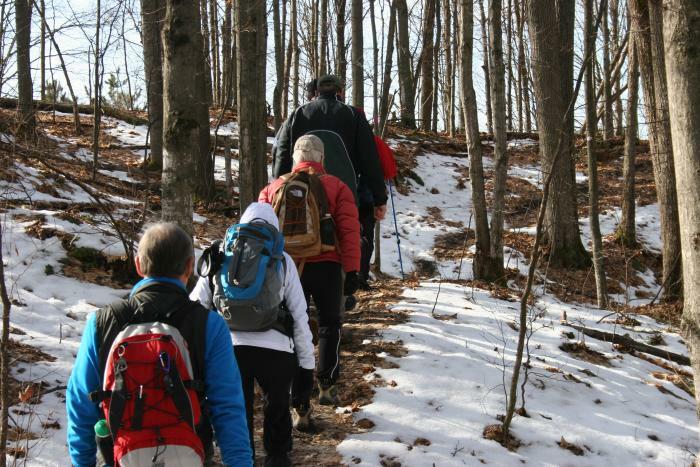 And be sure to check our events calendar for guided hikes! 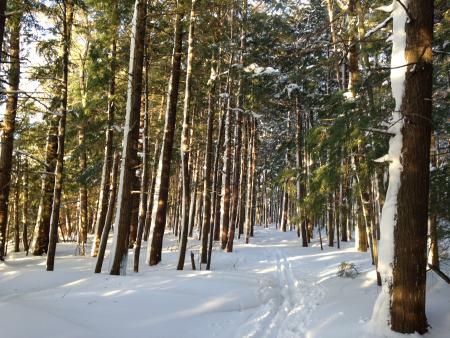 This is a beautiful hike in all seasons, but it’s particularly striking in winter. A former Girl Scout camp, this 250-acre gem boasts 2,000 feet of frontage on Long Lake and an entire 20-acre lake (Fern Lake) within its boundaries. The winding and gently rolling trails here are peaceful, scenic and rarely crowded. Many locals also ice fish on Fern Lake, but always make sure the ice is safe before venturing out! This large natural area near Bellaire is very popular with cyclists in the warmer months, and it’s easy to see why – with more than 31 miles of trail that wind through 765 acres of diverse and beautiful ecosystems, this place packs a punch. 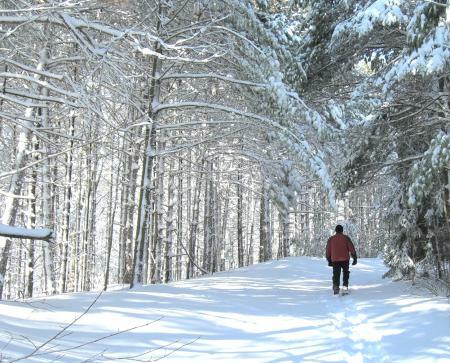 Once the snow falls, these trails make for an excellent winter hike or snowshoe (or fatbike!). The interweaving trails allow for a customizable hike – stay for 30 minutes or spend all day. This is an excellent example of what we at the Conservancy refer to as “nearby nature.” Situated just outside of Traverse City on the south end of the beautiful Old Mission Peninsula, this 62 acre natural area offers more than 3 miles of trail through fields and forest, including a beautiful and rare old-growth hemlock grove. Check out a colorful winter sunset at this natural area, which boasts more than a mile of East Grand Traverse Bay shoreline. More than two miles of trail wind through rugged coastal forest and along the beach. The south parking lot off Old Dixie Highway is plowed all winter, but the north entrance is not. It’s easy to miss this natural area as you zip along U.S. 31 between Traverse City and Elk Rapids, but it’s definitely worth a stop. Situated along a valley that contains its namesake creek, this 413-acre natural area offers great views and plenty of solace. Because it gets only light traffic, its nearly 3 miles of trail are ideal for hikers if the snow isn’t to deep. Otherwise, bring your snowshoes or cross country skis!